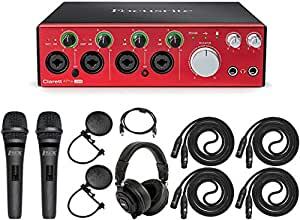 Focusrite’s Clarett audio interfaces feature high-performance, low-noise mic preamps with a low-distortion, ultra-linear design, 24-bit/192kHz digital conversion and extra headroom to handle the loudest pickup possible. This guarantees a clean, open and transparent sound. Additionally, each Clarett mic pre has a unique âAirâ switch, which, when initialized, will emulate Focusriteâs classic transformer-based preamps. The Clarett 4Pre offers 4 combination XLR/TRS inputs; 4 line outputs; S/PDIF and MIDI I/O; and up to 8 channels of additional digital inputs via ADAT. The iconic red front panel boasts a large rotary-style master fader and two headphone inputs with designated rotary controls for the headphone volume. Inputs 1 and 3 have their own phantom power switch and rotary gain dials giving optimal control over the level you send to your DAW. To protect against clipping, the Clarett 4Pre features Focusriteâs signature âGain Haloââan illuminated ring around the gain control dial that lights up green when thereâs signal and red when that signal is too high.